It’s not uncommon to see a company’s purpose statement presented on a plaque in a lobby—sometimes even etched in brass or written in beautiful calligraphy and framed behind glass. While the presentation is impressive, the reality is that in many cases, when you venture past the lobby and speak to the people who work in the business, they sadly have no idea that the purpose exists or what it means to them. In contrast, the Purpose at Michelman, a 70-year-old Evergreen company, where I serve as President and CEO, is central to every decision we make and the essential thread that weaves our global business together. Michelman is a worldwide developer and manufacturer of environmentally friendly advanced materials, often helping customers through alternative and new technologies. We cross multiple industry sectors, including industrial and agricultural coatings, digital printing, consumer packaging, and advanced composites for automotive and aerospace. Our Purpose, Innovating a Sustainable Future, reflects our commitment to solving big, intractable societal problems with sustainable technology through expertise and constant innovation. I often say we are building Michelman for the fifth generation of stakeholders—many of whom haven’t even been born yet. As we have grown, I have found that we do our very best work when we are fulfilling our Purpose in a way that equally prioritizes people, profit, and planet. When we live our Purpose, we do it in a way that provides our associates with professional, personal, and career fulfillment (people), contributes to the sustainability and greening of the world (planet), while still earning us reasonable return (profit). Here are a few examples of how we approach these three, equal priorities to find success as an Evergreen company. As a leader and business owner, I have the opportunity and responsibility to positively impact and build relationships with Michelman’s associates and other stakeholders every day. I want our associates to feel that Michelman is more than a place of employment. We want them to find meaning in their work and be proud of what they do, as well as develop positive relationships with colleagues and clients. Our goal is to have them go home a little more fulfilled than when they came to work in the morning. I believe that many of our associates have joined Michelman because of our Purpose of Innovating a Sustainable Future. This Purpose provides them with an opportunity to work toward something greater than themselves. Many of our associates continue to live this Purpose when they return home each day as they contribute to their communities and raise their families with kindness and consideration. One of my favorite parts of my job is walking around the organization and checking-in with our associates. It energizes me to learn about their lives. By getting to know these associates, I can help them grow within Michelman, share personal insight, or simply listen to them when things are not going well. This interaction is one small way I engage our associates as the unique, interesting individuals they are. We do our part to help our associates reach their full potential, which reflects our long-term commitment to them. We facilitate a number of “Leadership Accelerator” programs in which about 30 associates at a time, from a cross-section of our facilities and development centers around the world, attend a weeklong leadership development program that brings together all different work styles, cultures, and functions. 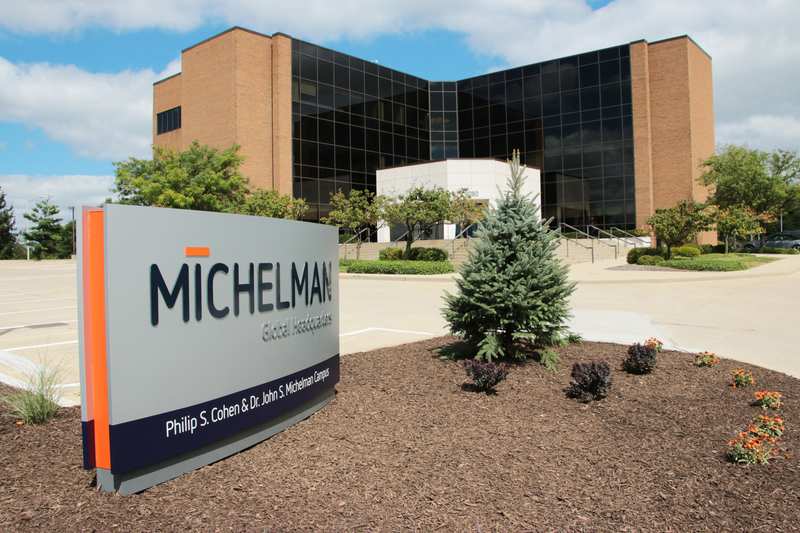 Candidly, this is an expensive and time-consuming undertaking, but it reinforces the importance of our people and is an essential investment in the future leadership of this company, and in sustaining Michelman’s success for the long-term. Michelman is in the solutions business. Chemistry is how we provide these solutions. We’re solving significant, interesting, industrial challenges with sustainable technology. We have a clear obligation to contribute to the sustainability and greening of our planet. Our Purpose is at the heart of everything we do and is reflected in the environmentally conscious solutions we provide. Some of these include: developing sustainable technologies that allow packaging to be compostable, recyclable, or biodegradable for consumer product goods companies, and packaging and food manufacturers; working with glass and carbon fiber producers to help the automotive and aerospace industries develop stronger, yet lighter materials to help increase fuel efficiency; developing water-based technology to improve performance in paint and wood coatings for homes and decks. The commitment to our people, planet, and long-term, Evergreen, outlook informs our approach to profit. While we are consistently quite profitable, there’s no doubt that we could make more money this year or next by ignoring people and planet. However, that wouldn’t align with our Purpose. We’re prepared to make less profit in the short-term to help solve hard problems. Because of this, we make significant investments into new technology and sustainability programs. These very long-term investments will help us to continue to address the big societal problems that affect our planet. Our Purpose means we have to have a long-term view to build long-term value. This focus on long-term value creation not only guides our investment decisions but our divestitures as well.We have exited business segments because they no longer fit our Purpose. So what’s the tradeoff to prioritizing people, profit, and planet equally in the pursuit of our Purpose? Well, it’s not fair to say, “No tradeoffs.” The reality is that the tradeoff is time. Luckily, as an Evergreen company, we have time. We have the luxury of making decisions based on these priorities because we are investing and building for generations to come. We may not see the immediate, measurable benefits of the decisions we make this year or, in some cases, even in our lifetime. However, we will continue to make choices based on our values and according to this philosophy because we genuinely believe in our Purpose of Innovating a Sustainable Future and the opportunity it offers to do good and treat people well. Steve Shifman is President and CEO of Michelman.